Can we really make crystals out of soap? You bet! These crystals grow really fast, provided your solution is properly saturated. In only 12 hours, you should have sizable crystals sprouting up. Sugar molecules are large and sugar water is very thick and syrupy, so the molecules can’t move fast enough to stick together in an orderly fashion in order to form crystals quickly. Supersaturating the sugar water by heating it up will help the mixture to form crystals a bit more quickly. Diamond are made of carbon, not laundry soap, so in this case, while it make look like a diamond, the internal chemical structure is laundry soap, so that’s what you get! Yes – make sure you are logged in first to see the video! Is there a video here or am I unable to see it? Wow – I have absolutely no idea, but if you have a video, put it on youtube and send me the link (put it unlisted if you want) and I’ll take a look and see if I can offer any suggestions. Our Family did this experiment. When we were reheating and dissolving the excess crystals afterword, we noticed that the pot wobbled. When the pot was square on the burner, it barely wobbled, but when we put the pot on the burner at an offset it wobbled a lot. We are assuming that the bottom of the pot is convex. We were also using an electric stove. There is no difference in height on the surface. Why did the pot wobble? We also have a video if you would like one. I just don’t know how to post one. Thanks for the help. I will have my team connect with with you right away! Enjoyed the webcast yesterday. We signed up for eSummerCamp and got started navigating around the site today. Looks like we don’t have access to making crystals from Borax. My 2nd Grader is looking forward to this experiment. Can you help us out? When my mom and I tried to get my crystal out of the container, it was stuck to a whole bunch of other crystals on the bottom and on the sides. Did we add too much borax? can you use other kinds of soap besides borax ??????? My crystals set up really fast like 2 minutes.Do you know why? You can do a lot of different crystals – I’ve given you instructions for salt, vinegar, charcoal, sugar, and more in this section, so look it over and find the one that works best for you! I live out of the country and i was wondering, is there a substitute for Borax because i have looked and cannot find it. Ah, good question. It’s the trigger to signal the crystals to start forming, and when they do (if you your solution is just right) they solidify very quickly. Yes – look at the “Rock Candy” experiment. You can add water and bring it to a boil (use a microwave or place in a saucepan of water) to dissolve the crystals. Is there any way to “uncrystallize” the borax? We used way too much borax, and now have two glass jars filled with a borax rock. Can I do anything to reclaim these jars, or should I just chuck them in the trash? did you find it hard to separate the dregs from the actual solotion? That’s normal. Borax doesn’t dissolve well in water – you’ll usually get bits at the bottom. Just add more water to see if you can get them to dissolve with a little more heat. I can make ghost crystals out of soap! Yes feel free to use food dye with this one! Yes, you’ll find a couple of these in Unit 9: Lesson 1, especially Mixing Cold Light and Rainbow Shadows. My guess is that you’ve pulled enough of the borax out to make the solution heavy on the water and light on the borax. You need a super-saturated solution to make the borax want to crystallize and fall out of the solution. You can pour the solution back into the pot on the stove and simply add more borax as before and then reuse it. We had great success with creating my sons crystal dagger… my dragon fly stuck to the side. The crystals formed very quickly! We are trying to create a geode with the left over solution in the 2 liter bottle. The first day tons of crystals formed, there is a very thick formation at the bottom of the bottle and about 1/4 inch thick up the sides. We are hoping to let the sides get a little thicker but 2 days later there hasn’t been much of a change. There is still plenty of liquid in the bottle. We where hoping to get the sides thick enough to withstand removing the bottle. Do you think we have all the crystals we are going to get out of the solution? 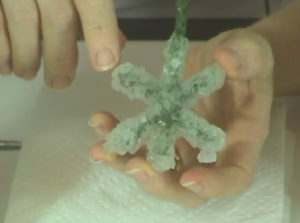 Aurora in the video your right the borax crystals grow fast. also I got chunks of crystals for only one experiment. A hot solution of borax and water can hold more borax than a cool solution. As the borax solution cools, crystals of borax “fall out” of solution and deposit on the shape you have placed in the container. This is not a chemical change, however. In a chemical change, bonds are broken and new bonds are formed between different atoms resulting in different substances. A physical change does not involve a change in the substance’s chemical identity. The crystals “grow” because the cooled solution cannot continue to hold all the borax that had been placed in it any longer. The shape you have put in the solution provides a home to the borax crystals that are falling out of solution. Yes – you’re absolutely right! Seeding the stick will speed up the crystallization process. Would it speed up the process if I “seeded” the pipe cleaner with borax before I let it sit? Just wondering. . .
is it safe to color the crystals with food coloring? The crystals are growing slower because wire is hard and nonporous and slippery while pipe cleaners are soft and porous? on are first try, we could not get the 2 cups of Borax and 2 cups of water to mixed.we mixed and mixed. So we dumped that one and turned up the heat. then it seemed to work so i let it sit for a few minutes and saw crystals forming on top when we came back..we took the crystals off the top then poured just the liquid into a 2 liter soda bottle like you shown . we put the stick in it, we a snowflake pipe cleaner hanging from holes on the side . We looked at it three hours later and it just looks like a big rock with some water in it. What did we do wrong? Oops! Sorry – I didn’t see your question before. The temperature of the water is going to affect how much borax you can dissolve into the solution. What happens when you heat the solution? Does it reduce the slush on the bottom? When you pour it into your jar, don’t add the slush – it will only concentrate the growth in the wrong place. Just use the solution you mixed up – that should grow your crystals overnight. You want to dissolve as much of the borax into the water as possible, so bring your water to a boil when you add your borax to help you do this. Let me know how it goes. I guess I needed to write a question to get a response. We were not able to get our Borax to dissolve. We got a little bit of crystals in the end, mostly we got slush in the bottom. Why weren’t we able to dissolve two cups of borax in two cups of hot water? You used more than that. We stirred and stirred a long time and didn’t get it to work right. really liked the video, think that I am going to try it! Once you make the Borax Crystals, do they ever get out of the “crystal form” an go back to liquid?? That was so cool to watch!!! We’re working on this right now and having a hard time getting it dissolved. We put in 2 cups of water and 2 cups of borax and heated it almost boiling, but we still can’t get it all dissolved. In the video you added much more than 2 cups. We’ll see if it grows crystals. The sugar solution tends to be trickier, as the solution really must be really super-saturated. If you’re a little unsure about whether it will set up or not, dump in extra sugar and stir over the heat until it all dissolves. Continue to add sugar until you simply can’t get it to dissolve anymore. (Don’t stop here, though, or you’ll get a solution that will solidify in one huge chunk, and you’ll never get it out of the jar.) Add a bit of water (just enough to make those stubborn undissolved bits at the bottom disappear) and then you’ve got the perfect solution. Depending on how much you make, this cooling process could take an hour or more (get it down to the 120s deg F). Try not to shake the sugar solution too much after crystals start to form on the stick (send the kids home with the syrup in a sealed jar and stick in hand). You can help it along by adding a sugar-coated stick to the solution when first inserted. Yes, this was helpful. How far ahead of time can I make the sugar solution? Can that be done the night before? I’ve done the borax crystals with my own kids before so I know that is fairly easy but we have not had good luck with the sugar yet. This is a great one to do with a group of kids, as you can whip up a large batch and then send it home with them. You might want to test your solution out ahead of time to make sure it’s saturated enough. If you’re worried about the solution not setting up right, you can always make it ahead of time, and when you get there add a bit more water and solids to have them get the essence of what you’re doing (this might be a good idea for the rock candy solution, however you really can’t go wrong with the borax crystals). Once it’s cooled down A LOT, pour it into the jars (you don’t want kids sloshing around a lot of hot liquid). With the borax crystals, you can just keep adding fresh pipe cleaners to the room-temp liquid each day to get a fresh crystal growth – it doesn’t need to stay hot. Lids are fine for transport, but just be sure to demo what you want them to do when they get home. Does that help? I was planning on doing this project with a group of kids and I’m wondering if it is important to have the jars undisturbed once pouring in the hot saturated solution. Would the jars be okay to travel home with? Could we just put lids on until they got home? Will this work with the Rock candy crystals too?